Note: The examples were done with xUnit.net v2.2 and Visual Studio 2017. The version numbers, paths, and Visual Studio UI may differ for you, depending on which version you're using. When creating a new project with Visual Studio 2017, you may not end up with a packages.config file. 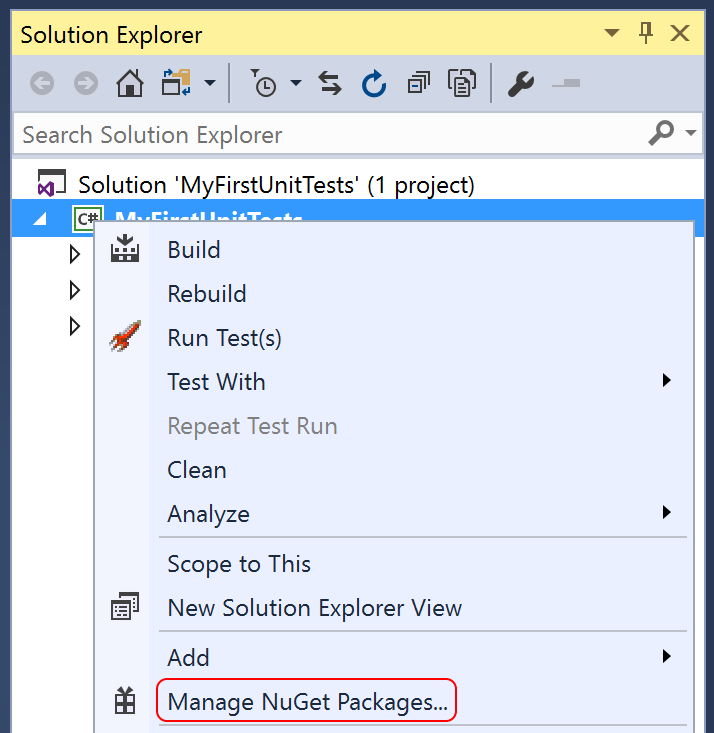 That's okay: newer versions of Visual Studio place the NuGet package references directly into your .csproj file as <PackageReference> elements like you see here in our xunit.integration project. The advantage is that you not only have one fewer file, but you also only have packages listed for which you've taken direct references. That makes it easier to differentiate between the packages you've chosen to install and the dependencies they bring with them. Build the solution to ensure that the code compiles. Now that you've written the first test, we need a way to run it. Let's install the NuGet package with the console runner. Unlike the previous package (which added references to the unit testing framework), this package is what's known as a solution-level package. Instead of having assemblies to reference, it adds some tools in your solution folder. We will use one of these tools—the console runner—to run your unit tests. Although we've only written 3 test methods, the console runner actually ran 5 tests; that's because each theory with its data set is a separate test. Note also that the runner tells you exactly which set of data failed, because it includes the parameter values in the name of the test. Important note: If you've previously installed the xUnit.net Visual Studio Runner VSIX (Extension), you must uninstall it first. The Visual Studio runner is only distributed via NuGet now. To remove it, to go Tools > Extensions and Updates. Scroll to the bottom of the list, and if xUnit.net is installed, uninstall it. This will force you to restart Visual Studio. 0 The tests ran successfully. 1 One or more of the tests failed. 2 The help page was shown, either because it was requested, or because the user did not provide any command line arguments. 3 There was a problem with one of the command line options passed to the runner. 4 There was a problem loading one or more of the test assemblies (for example, if a 64-bit only assembly is run with the 32-bit test runner). 0xC000013A (-1073741510) The user canceled the test execution by pressing Ctrl+C.